Sachi Graber of the Rocky Mountain Institute describes a $200 million opportunity in Nigeria to develop undergrid minigrids, projects that shore up electricity for those served by unreliable grids. Traditionally in sub-Saharan Africa, electrification efforts have emphasized the hundreds of millions of people who live off-grid, with no electricity at all. The “formula” for electrification usually includes expanding supply, extending the grid, making new connections, and stimulating end-use demand. But another often overlooked population — a population as large as that living off-grid — faces many of the same challenges. This population, which we call “under the grid,” is composed of those who are nominally considered electrified, but are served by unreliable (in Nigeria, just two hours per day on average) and low-quality power from the grid. A new Rocky Mountain Institute and EMRC report, Under the Grid: Improving the Economics and Reliability of Rural Electricity Service with Undergrid Minigrids, focuses on what to do about the thousands of communities in Nigeria alone that face the challenge of being under the grid. 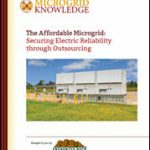 This report proposes undergrid minigrids as a solution that can drive electricity access, stimulate local economies, and improve quality of life. This solution can empower communities through better energy service, create a $200 million opportunity for project developers, and save distribution companies up to $6 million each annually. It’s tempting to place blame as to why reliable and useful electricity is not available in undergrid communities, but that’s a slippery slope. In practice, everyone is losing out under today’s status quo. All stakeholders have something to gain by forging a solution—including distribution companies, minigrid developers, and most importantly, communities. For example, distribution companies are losing money — lots of it — trying to serve undergrid customers. But in Nigeria, unmetered connections, low collection rates (around 30 percent for the estimated bills often provided in rural communities), and other factors mean that the utility (distribution company) loses money for every kWh delivered to these communities. We estimate this loss at $0.21 per kWh—or about three times the regulated tariff for most households. Meanwhile, rural businesses and households turn to prohibitively expensive, polluting diesel and petrol generators in an attempt to bridge the gap between the electricity they need and the reality of what they’re actually getting (or not getting) from the utility. Customers turn to these solutions to provide the reliable power required for quality-of-life gains and economically productive uses of electricity, such as welding, grinding grain, or pumping water. For example, despite the electricity present in their community, low grid availability forces Godwin and neighboring entrepreneurs to use expensive diesel generators for their welding and carpentry businesses in Lukogbe community of Nigeria’s Ogun State. 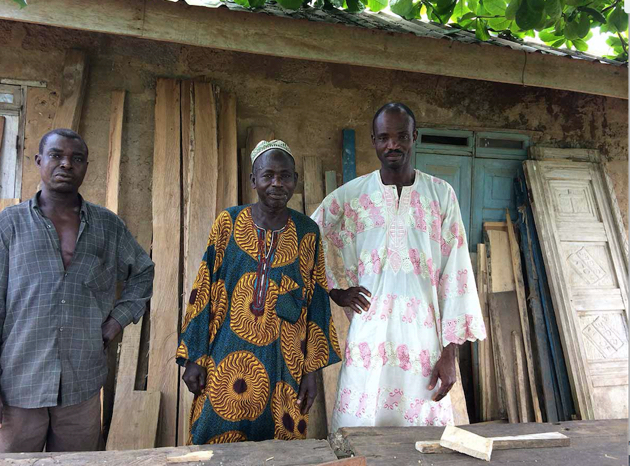 Minigrids present a transformative solution for these communities. Undergrid minigrids can be deployed in such areas of Nigeria, and whether operating as an “island” or exchanging power with the grid, they could contribute to a foundation of sustainable, cost-effective distributed energy resources that enhance Nigeria’s power sector resiliency. 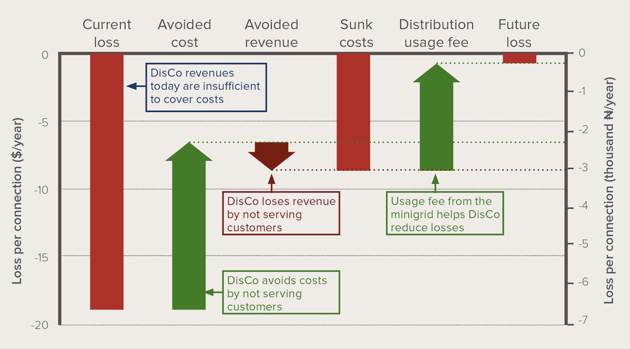 By divesting customers from traditional grid service to undergrid minigrids for a period of time, distribution companies can interrupt the pattern of revenue loss. Through a distribution network usage fee imposed on minigrids, distribution companies could even overcome their current losses and reach revenue neutrality in rural communities. A single distribution company that implements 400 undergrid minigrids in loss-making rural communities could save approximately $3 million per year — or up to $6 million if it charges a usage fee to the minigrid for distribution infrastructure. At the same time, minigrid developers who step in to build, own, and operate rural electricity solutions gain access to a huge market opportunity. In Nigeria alone — where there is already strong policy and regulatory support for undergrid minigrids and a confluence of enabling factors — developers are looking at a $200 million profit potential. And for customers, electricity costs will be cut by 25 percent by transitioning to an undergrid minigrid model; we estimate a savings of $0.15/kWh off of the $0.60/kWh cost to run diesel generators in Nigeria. Of course, other substantial benefits come along with “upgrading” from two hours per day of unreliable, low-quality electricity to consistent, high-quality power. The economics make undergrid minigrids a winning proposition for all stakeholders. But these systems have yet to be tested. An important next step will be for utilities and developers to partner on the implementation of proposed business models and to evaluate the ability of minigrids to underpin local development. Once proven, undergrid minigrids can rapidly scale to improve service and outcomes for millions of rural customers across Nigeria and sub-Saharan Africa at large. To learn more, download RMI’s new report, Under the Grid: Improving the Economics and Reliability of Rural Electricity Service with Undergrid Minigrids. Peter Bronski, Katie Lau, and James Sherwood contributed to this article, which originally appeared on RMI Outlet and was reposted with permission.